Despite popular belief, “Oktoberfest” is not how you say “beer” in German. In October 1810, Crown Prince Ludwig, who later became King Ludwig I, wed Princess Therese of Saxony-Hildburghausen. The town citizens were invited to celebrate the royal wedding and commemorative horse race in front of the city gates in Munich, Germany, and they had such a good time that they returned every year henceforth. Today, the Oktoberfest is a 16-day annual festival still held in Munich. There are rides, games, music, food, and, of course, there’s beer. In fact, each Oktoberfest, nearly two million gallons of beer are consumed during the festival. If a ticket to Munich doesn’t quite meet your budget this fall, consider bringing Bavaria to you by hosting an Oktoberfest bash. With these tips, you’ll have your friends hoping to return year after year, much like the revelers of yore. Oktoberfest officially begins in the Schottenhamel tent at noon. There, the mayor of Munich taps the keg and declares, “O’zapft is!”, which means “it’s tapped.” At this moment and no sooner, everyone else can begin to drink. As the actual mayor of Munich will probably be unavailable for freelance personal keg tapping hire, elect an honorary mayor of Munich at your bash through popular vote to get an authentic start to your party. Many domestic breweries such as Samuel Adams, Great Lakes Brewing Co., Brooklyn, and our local regional favorite, Yuengling, have seasonal Oktoberfest beers. These offerings are typically malty brews with mild hops and a slightly higher-than-average alcohol content (5-6% ABV). However, despite the labels, only a handful of beers in the world actually qualify as true Oktoberfestbier. These beers must adhere to a number of stringent regulations, including being brewed in Munich by a Munich brewery, and they are the only beers that are permitted to be served at the official Oktoberfest. The breweries that made the cut are Augustiner-Bräu, Hacker-Pschorr-Bräu, Löwenbräu, Paulaner, Spatenbräu, and Staatliches Hofbräu-München. However, even if you’re sticking with domestic drafts, leave the pint glasses and solo cups on the shelf and stock your party with beer mugs. At the official fest, regulation beer mugs are called Maß and hold 1 liter of beer (33.8 fl oz). 3. Drink, Be Merry, and… Eat! Most holidays and special occasions have been simplified into a holy trinity of merriment, drinking and food, and Oktoberfest is no different. Soft Bavarian pretzels is a snacking staple, but if you’re running short on time, a bowl of hard pretzels are a great substitute. 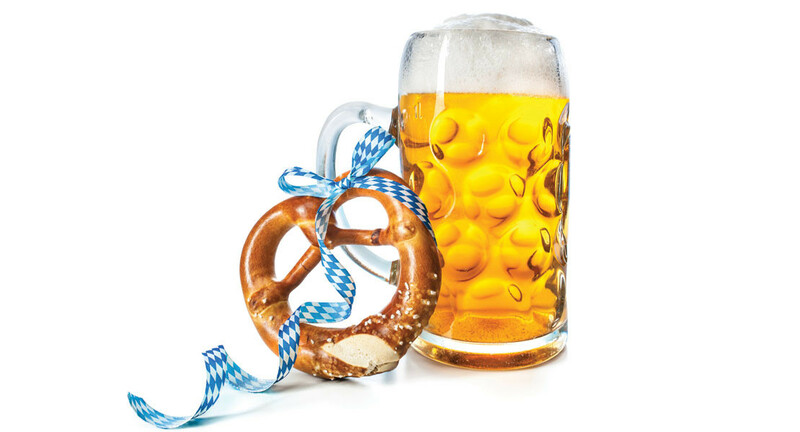 Beer cheese in any form (soup, fondue or dip) is always a crowd pleaser, and a serving plate piled with chicken schnitzel, roast chicken, bratwurst, sauerkraut, spaetzle, potato salad, or apple strudel will satisfy both your guests and the tradition of the holiday. Get your lederhosen pressed and dust off your dirndl! If you’re going all out, men should sport a pair of shorts with suspenders that have a front cross strap, long socks, and Trachten hat; women can don a blouse, bodice and full skirt with an apron. While traditional Oktoberfest garb is fun and especially accessible due to the event’s proximity to Halloween, it might also not be the most practical choice. Many modern celebrants instead opt for checkered shirts or dresses to show their spirit. A few thoughtful choices can transform your space into a tent fit for ’festing in no time. Blue and white, the colors of the Bavarian flag, are the unofficial colors of Oktoberfest. Checkered patterns are considered traditional and can be used for tablecloths, runners and napkins; blue and white streamers hung from a ceiling light or fan can help transform your living room into a tent; and if you have a picnic table, you now have a Biergarten! Every party needs a soundtrack to remember. For an authentic Oktoberfest party, the laconic tune “Ein Prosit” is a must. In Munich, it’s played in each tent every 20 minutes or so to bring revelers together to drink. Traditionally, people stop what they’re doing and stand up in reverence as though a national anthem is about to be sung, toast and chug their beers. Many music apps (e.g., Pandora and Spotify) also offer Oktoberfest playlists that can be popped on in a pinch. 7. Don’t Forget the Games! Imported beer can be pricey, so if your budget only allows for a few bottles straight from Deutschland, why not turn it into an event? For fun, do a blind tasting along with descriptions of the beers from the brewery and see if any of your guests’ palates are refined enough to guess which beer came from which brewery. In Bavaria, holding a mug of beer out in front of you at shoulder level for as long as possible is considered a feat of strength and endurance. When you consider that the Maß weighs about 5 lbs., it’s easy to see why – and although it may sound like no sweat, the average participant can only last four minutes. No beer may be spilled, no elbows may be bent, and arms must be kept parallel to the ground at all time. The last outstretched arm wins.